The iPhone and iPad can capture amazingly high definition video in 4K, 1080p, and 720p resolution, and while those movies will look fantastic they also create large file sizes. 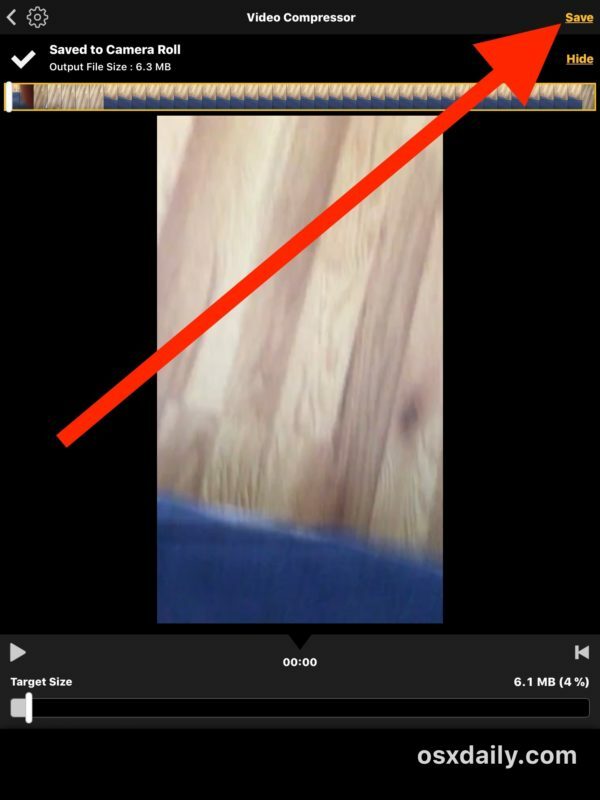 While you can always change the recording resolution of video in iOS ahead of time, another option is to compress video after the fact, thereby reducing its file size dramatically. Compressing video is helpful particularly if you want to share a video from an iPhone or iPad but you’re finding the movie file size is too large for a standard file transfer, message, or email. We’re going to show you how to compress video on an iPhone or iPad to reduce the file size or lower the video definition quality. Compressing video is not a feature that is built into iOS natively however, so we’ll be relying on a free third party app that does the job quite well. To be clear, this approach is taking a video file that is already recorded and stored on the iPhone or iPad and compressing it. If you want to make a smaller video file size to begin with, you can change from using 4K video capture to 1080p or 720p ahead of time, or changing the video recording frame rate at 60fps or 30fps, each of which will reduce the file size of a movie recording, but obviously that’s not helpful for changing the compression or video quality on a video that has already been captured. 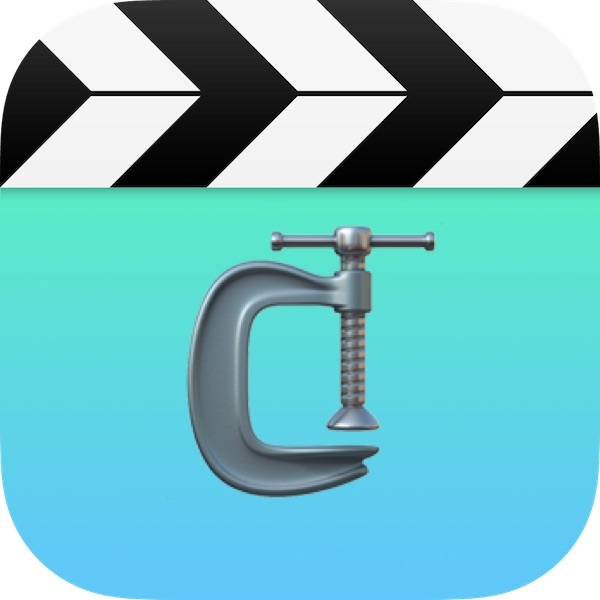 Thus, we’ll use Video Compressor to shrink down and reduce the file size and definition of a video in iOS. Video Compressor is very effective and you can easily shrink a very large high resolution video down to a remarkably small size. In the example above I shrunk a video to 4% of it’s original size using Video Compressor on an iPad, taking a 150mb video down to a mere 6mb. Of course this comes at a hefty cost to the video quality, since compressing video inevitably reduces the resolution and definition of any video, so use the slider and target size to suit your own use case and needs. The ability to compress video to shrink down size and reduce quality should probably be built directly into iOS so that iPhone and iPad users can do this directly in iOS without requiring third party apps (a similar feature exists native in Mac OS video encoder tools), so perhaps we’ll get such an ability in iOS down the road too. Keep in mind if you use iCloud (and you should) then if you try to email a very large video then you should be able to share it with Mail Drop too. And of course if you’re nearby to the person you want to share a large video with, then sending over AirDrop from an iPhone to a Mac or other device is a viable solution too. It’s also worth pointing out that if you want to copy high definition videos from an iPad or iPhone to a computer the best way to do that is with a USB cable and direct transfer as described here, it tends to be the fastest approach that is also lossless. 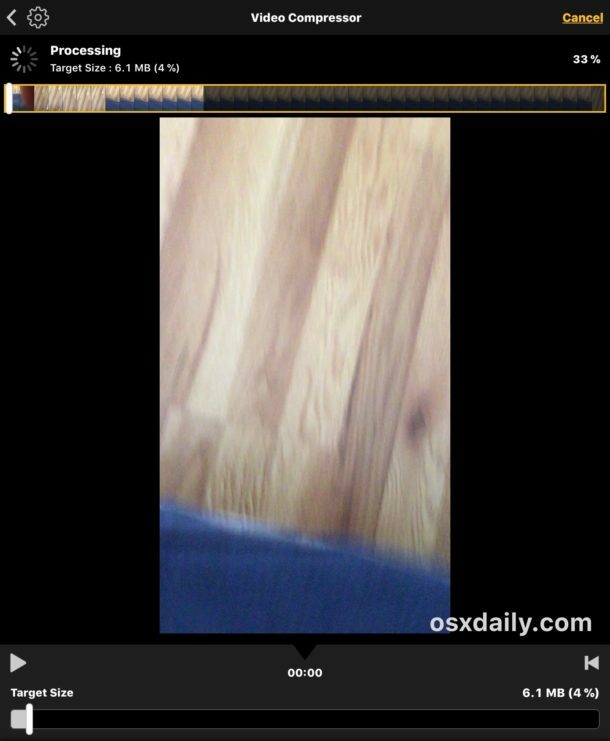 Do you know of another better way to compress video directly on an iPhone or iPad? Do you have a favorite solution or iOS app for this task? Let us know in the comments! 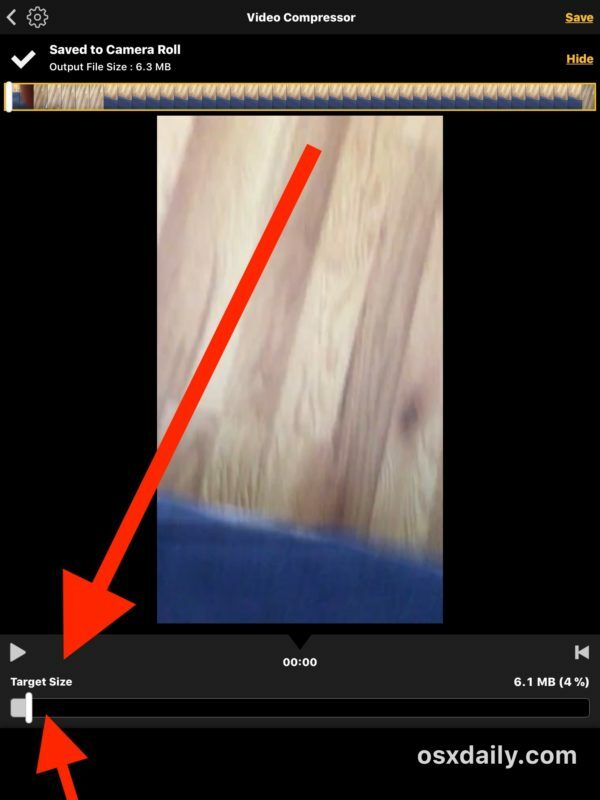 That’s a savvy trick too, but it doesn’t tell you how large the resulting video file is unfortunately. I think Apple should put it in the sharing menu, which is really more like an action menu. Is it possible to retain the original video?or perhaps to make a copy of it? IMPORTANT QUESTION. In most cases we would want the original to left untouched. Yes go to the sharing menu and choose “Duplicate” on the video you want to make a copy of the file, you can do it right in Photos app. Thanks Owen. That’s exactly what I needed to know. You can duplicate the video (or photo) first using what I call the Output menu (box with arrow out of top) before compressing one. Sounds like this tool “compresses” the video by significantly reducing the quality/resolution. So it’s not really compressing, but simply reducing quality and resolution. True “compression tools” reduce file size by special compression techniques, but then they uncompress the file when you want to use it. Thereby retaining original quality and resolution, but utilising a smaller file size. This tool may have a place on some people’s devices, but it isn’t a true compression tool. Exactly, Steve, this is NOT a video compression tool, it’s a video reduction tool, it reduces resolution, thus reducing quality. It likely applies these to the original thus rendering the video to a permanent state of poor quality. As noted by Pat, simply texting the video accomplishes the same thing but without changing the original. 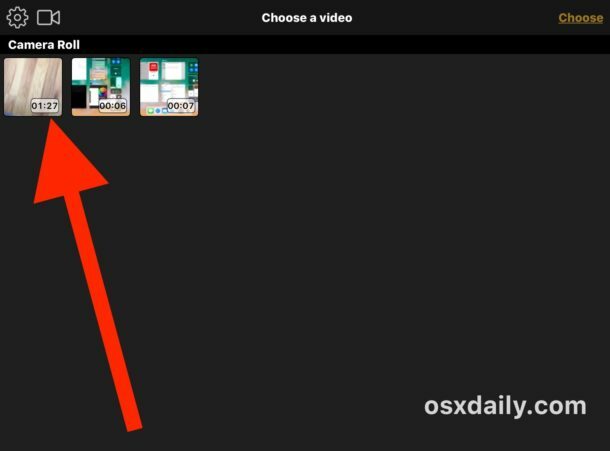 To save a video from an iDevice in it’s original quality using OSX, connect to your Mac via USB cable, and go to applications-image capture, launch it, and select your phone on the left side list. 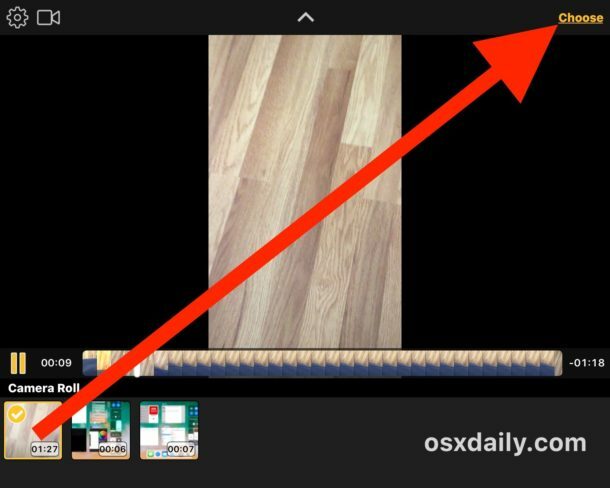 All videos and pictures will appear in a list you can sort in a multitude of ways. Click on any or all and drag them to where you want to store them on your mac. This creates a copy of them, leaving the originals on your phone untouched. If you wish, you can bulk delete from image capture, but because apple thinks we are all idiots with their two stage deletion, you STILL must go to recently deleted in camera roll and remove them from the phone. As mentioned the compression reduces resolution and image quality, does it effect the sound quality as well or is that retained. When I share my guitar videos I don’t care as much about the image but I want the sound to be as good as possible. Any thoughts or experiences?